Such authority is cited by Roy Beaton, secretary of the San Pedro Chamber of Commerce to counteract stories deemed damaging and untrue that swimmers of the Catalina channel are being terrified by the monsters, and guns from escorting boats have been brought into play. Half a dozen species of sharks thrive here, but of such harmless kinds as the blue, bonito, shovelnose, leopard, dog and hammerhead, according to H. B. Nidever, in charge of Terminal Island laboratories for the California Fish and Game Commission. Police and hospital records also fail to disclose a single victim ever attacked by anything but stingrays and little octopi, now retreating from the beaches before the advancing hordes of bathers. Southern Californians are not fooled by such canards, according to Beaton, but the fabrications about man-eating sharks is bad California doctrine for the rest of the world that some day hopes to frolic in the Southland’s waves. CATALINA FISHING—A few days ago a large school of bait came in close to shore near the pleasure pier and the bath house; some were driven ashore by small barracuda, of which there are a number from 6 to 10 inches long around now. They are fish that hatched out this past summer. The past week has been a great one for catching white sea bass. The best run since 1929 is on now. They are seen around all the piers, the quarry pier, Toyon Camp pier, at the Isthmus, St. Catherine pier, Casino pier—even around the pleasure pier. Catalina Fishing—The boys have been having a lot of fun trying to land some of the big yellowtail from the Pleasure Pier. They are around daily. Plenty of little green-back mackerel every morning for the pier fishermen. Catalina Fishing—Most all summer there has been a small school of three yellowtail around the Pleasure Pier daily. One of the big fellows might be the fish caught by C. R. Martin of Avalon, a light tackle fish of 25 ¼ lbs. That is a catch hard to beat. Catalina Fishing—The past week finds fishing getting better daily. The yellowtail are being brought in, and now barracuda are arriving to feed. Quite a number are in the catches. Tuesday evening, May 5, Pat Casey, better known as “Barracuda Jim”, caught and landed the first white sea bass of the season—a beauty of 45 lbs. Time, 15 minutes. He was fishing from the end of the Pleasure Pier when he got the strike. It was dark, but the way the fish ran he knew he had a fine catch. He caught it on a number 15 line. There are quite a few seen along the coast. Catalina Fishing—The Pleasure Pier is a very interesting place evenings now, as so many are going out after swordfish. Many anglers are getting fish hooked and lost. Many are also being caught these days. Mornings and evenings boys and girls are seen on the pier fishing for the little greenback mackerel. Some rock bass are also being caught. There is a lot of bait in the bay now, as almost every morning the larger fish outside chase the bait in near the pier. The sardines and little mackerel are growing fast. They are this year’s hatch, and each day sees them a little larger in size. The sardines are big enough to be good bait for rock bass. History of Avalon and the Green Pleasure Pier. 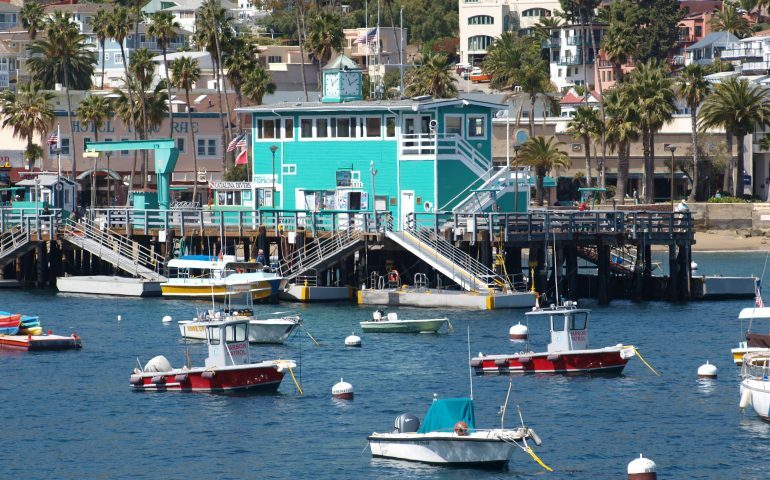 The “Magic Isle,” the “Enchanted Isle,” the “Island of Romance,” “Fantasy Island,” or “Beautiful Isle Of The Pacific”— all are simply names bestowed upon one of my favorite places to visit—Santa Catalina Island. As deserving the names, it’s also an island rich in history with some good times and some hard times, some good events and maybe a few that weren’t so good. But it’s also a fascinating history one that was rarely boring. Although Catalina had once been populated by the Gabrielino/Tongva tribe, who called the island Pimu or Pimugna, all had died or moved to the mainland by the mid-1800s. In 1602, the island was rediscovered by Spanish explorer, Viscaino, who landed here on Saint Catherine’s Feast Day (St. Catherine of Alexandria). He named it Santa Catalina Island in her honor. A German immigrant, Augustus William Timms began to run a sheep herding business on the island in the 1860s. He would bring people over to the island on his boat, the Rosita, for bathing and fishing and the small settlement soon was called Timms Landing by most (although some used the name Dakin’s Cove up until the eventual sale of the island). By 1883 Timms Landing had three buildings and thirty tents. 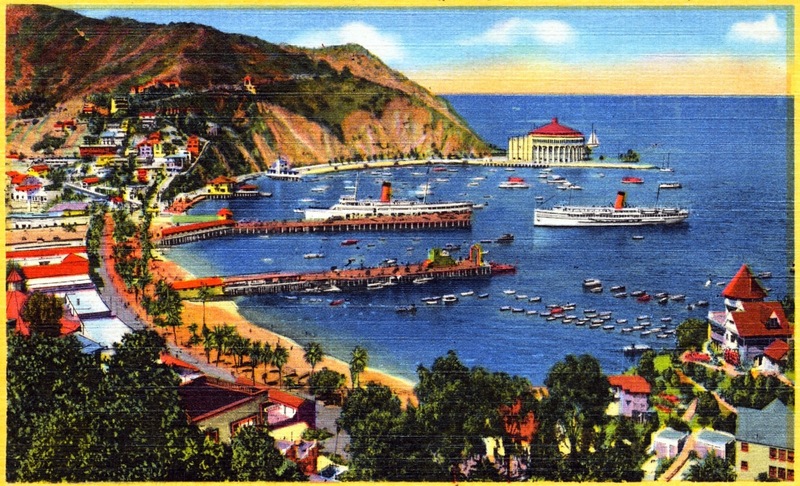 In any historical sketch of the seaside resorts around the city of Los Angeles, mention of Catalina, the Magic Isle, could hardly be omitted. While Santa Monica and other beaches on the mainland were easily accessible in the pioneer days, the trip to Catalina was rather a serious matter. There was no daily steamer plying between San Pedro and the island in those early days, nor was there any regular means of communication between the island and the mainland. But the magical attractions of the island were well understood by the scant population of Southern California in those pioneer days. The way of enjoying the pleasures of island life at that time was to form a party more or less numerous, anywhere from half a dozen to a score. These provided themselves with tents in families or in little cliques of bachelors or bachelor maids, the latter, of course, under a chaperone. These were taken to San Pedro by stage, and from the embarcadero over to the island in a big sailboat or yawl hired for the occasion. These campers would find a good deal of difficulty in returning to the mainland for provisions, and so a complete outfit was generally taken of canned goods and other non-perishable foods to last for ten days or two weeks, while the party was to remain on the island. California cook stoves and other camp paraphernalia were prominent features in these outfits for camping upon the island. Of course, there were small boats there, which could be hired to row and fish. There were more wild goats on Catalina at that time than at present, and there were no restrictions about either shooting or fishing. There was no more ideal camp life in the world than that enjoyed by the few adventurous spirits among the pioneers, who, spurning accessible Santa Monica, crossed the twenty-mile channel, cut themselves off from the world for two or three weeks and lived upon camp rations during the whole of their stay on the island. The sea easily furnished one-half of the food of the encampment, and it would be hard to conjure up in one’s mind a more tempting and delicious breakfast than that of fish, fresh caught from the salt water, and broiled upon the coals an hour after they came out of the sea. It is about twenty years since the Banning brothers bought the island from the Lick estate and established means of easy communication between the mainland and the island. Since then Avalon, with its fine hotels and other features of town life, has grown up upon the beautiful bay. But the features of life upon Catalina at the present time do not come within the scope of historical reference. In 1887, real estate speculator George R. Shatto bought Catalina Island for $200,000 from the estate of James Lick. Shatto developed the town site (including laying out streets) and his sister, Etta M. Whitney, gave it the name of Avalon, apparently naming it after a mythical island valley in the Tennyson poem Idylls of the King, the paradise where King Arthur’s Knights of the Round Table went to heal their wounds. A 1903 edition of Webster’s Dictionary gives the meaning of Avalon as “Beautiful Isle of the Blest,” and “Bright Gem of the Ocean,” so perhaps she was right. Shatto saw Avalon as a vacation destination and soon set up a steamer service to the mainland. To house the visitors, Shatto built the Metropole Hotel along Avalon’s shoreline, while he also began to sell tiny, inexpensive lots. Tents were erected as vacation cottages on many of these lots and Avalon soon had a tent city (dubbed “Catalina’s White City” by newspapers), a precursor of sorts to those that would be established at Coronado, Long Beach, Redondo and other seaside cities. However, echoing the boom and bust nature of real estate in southern California in the late 1880s and early 1890s, Shatto went broke, defaulted on his loan, and the island was returned to the Lick estate.